"Lights All Askew in the Heavens," proclaimed a headline in the New York Times on Nov. 10, 1919. The reason: results had just come in from the very first test of Albert Einstein's new general theory of relativity. "Men of Science More or Less Agog over Results of Eclipse Observations," the headline continued, in what passed for breathless excitement back then. The key theory that had the scientists so giddy was Einstein's claim that space and time were elastic, and could be warped and stretched like taffy. The test that proved it involved observing stars whose position in the sky makes them appear to be close to the sun and measuring whether solar gravity warped space-time enough to distort the starlight slightly. A 1919 solar eclipse allowed scientists to see the stars clearly and make the necessary measurements  proving that the great man's theories were correct. You might think that when a scientific finding hasn't been seriously challenged for 93 years the matter would be pretty much settled, but experimentalists have been poking and prodding Einstein's premises ever since. There's more than just stubborn skepticism at work: some of relativity's more esoteric implications are fiendishly hard to confirm, so the physicists keep devising more and more sensitive and difficult studies  even though the theory keeps passing them all. Which explains a recent announcement out of NASA headquarters. After no fewer than seven cancellations, followed by seven reprieves, the space agency's orbiting Gravity Probe B mission, or GP-B for short, has at last confirmed not one, but two of relativity's more subtle predictions  and it took only 51 years and three-quarters of a billion dollars to do it. To understand what the probe found, you first need to know about space-time, the four-dimensional stage on which everything in the universe plays out. What we think of as gravity, Einstein said, isn't a force that pulls two objects toward each other. Rather, it's a warping of space-time itself that makes objects want to move. The classic real-world analogy is a bowling ball on a trampoline: the ball makes the trampoline's surface dip. That's something vaguely like the way a star or a planet makes space-time warp. 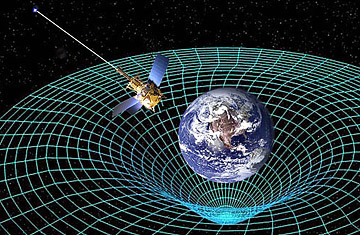 The big difference is that space-time isn't a flat surface, but something that fills the universe. This makes the warping pretty much impossible to visualize, even for physicists, so don't try. In any case, if you roll a marble close to the bowling ball, it will naturally fall into the depression  just as a passing meteorite falls to Earth. That's part one. Part two is that since the bowling ball represents Earth, it isn't just sitting but spinning, which makes the surface of the trampoline twist a little in the direction of the spin. The same goes for the space-time surrounding our spinning planet. What GP-B did was to measure both the dip and the twist. The spacecraft managed that impressive feat by carrying four of the most perfect gyroscopes ever built  actually, they're superconducting balls of niobium  into orbit around planet Earth while the ship itself pointed unerringly at the star IM Pegasi for 17 months, starting in 2004. The balls, meanwhile, floated independently inside, supported only by magnetic fields. If the gyroscopes kept the same orientation as the spacecraft that bore them, Einstein would have been refuted. But they wandered a bit, meaning the satellite was flying through gently twisted space. Relativity had come through once again. It took years to figure that out, though, because the experiment turned out to be flawed. Patches of electric charge had built up on the surface of the balls, adding an extra force that proved extremely tricky to unravel. And even when the physicists had done so, they found they could measure the dip in space-time only to an accuracy of 1%, and the twist, formally known as frame dragging, to a flabby 19%. In the half-century since GP-B was first proposed, moreover, other physicists have confirmed both effects. "I have to compliment the Gravity Probe B team for their result because Gravity Probe B is a very difficult and very beautiful experiment," the Italian physicist Ignazio Ciufolini told the website ScienceNOW. He was clearly being polite, considering that his own LAGEOS satellite measured frame dragging with higher precision a few years ago. LAGEOS and the other experiments that yielded similar findings weren't necessarily cheap, but they didn't cost $750 million either  a price that even NASA was finally unable to afford. It backed away from funding the last stages of the project, relying on a Saudi scientist to kick in the final few million. So was Gravity Probe B worth it? To hear GP-B scientists tell it, the experiment was a resounding success. But in order to justify that judgment in the face of the high cost, slow progress and imprecise results, they knew they couldn't simply invoke Einstein. Instead, they also felt the need to point out that people who had worked on GP-B as grad students had gone on to do important things (Sally Ride became the first American woman in space! ), and that the technology developed for GP-B had widespread applications  including, believe it or not, GPS systems that now help farmers plant very straight rows of corn. For anyone familiar with the NASA press office, this isn't a huge vote of confidence. If you need agriculture to justify a fundamental physics experiment, you're clearly feeling a little desperate. And with sharply declining budgets, better corn rows won't likely persuade the agency to spring for more big-ticket tests of general relativity. But money for such studies didn't seem to be forthcoming anyway. Just last month, NASA announced it was backing out of a proposed space mission called the Laser Interferometer Space Antenna, designed to look for gravitational waves  yet another of relativity's strange predictions. It may be a while, in other words, before men of science  and the women who long since broke into that once exclusive club  get to be more or less agog again. Watch "10 Questions for Stephen Hawking."